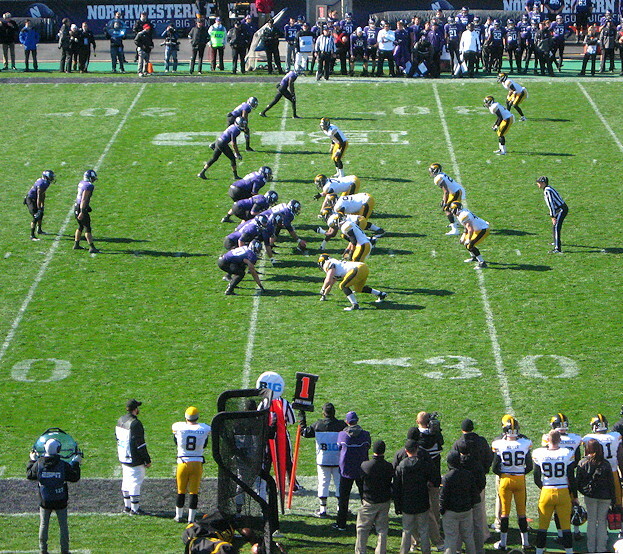 In late October, I attended the Northwestern-Iowa football game in Evanston, Illinois. I’m not here to talk about the game, though. I mean really – if you’re a fan, you already know that Northwestern won handily by a score of 28 to 17. And besides, this isn’t a sports news site; it’s my personal blog, so reporting on such a widely known event is never my purpose here. I simply want to report on a particular event that occurred during halftime. First, a few side notes. The above photo was taken from my seat at Ryan Field. I went alone, so I was able to get a decent seat even though I bought it only a few weeks in advance. Quick Tip: When attending sporting or theatrical events, it is often possible to find excellent single seats at a late date, even at the last minute. My entire reason for attending the game could perhaps be described as a mini-mid-life crisis. I realized recently that as big a fan as I am of college football, I’d only attended one college game in my life. Well now, here I am living on the north side of Chicago, only minutes away from a Big Ten school and stadium! I decided this had to change. Full disclosure – Many years ago, my brother Dan and I stood on a wooded hillside in Ithaca, New York that happened to overlook a football stadium and watched a few minutes of an Ithaca College game, but I can’t count that as properly attending a game, particularly since we couldn’t even tell who they were playing. Back to the matter at hand – at halftime of the Northwestern-Iowa game, the Northwestern University Marching Band came out on the field to perform for us. At the same time, I was sitting in my seat, debating whether my bladder could make it through the second half, or whether I should brave the crowds leading up the men’s room and perhaps miss the start of the third quarter. The stadium announcer’s voice rang out: “We begin with our tribute to Hollywood and television theme songs, beginning with ‘Goldfinger.’” As the band played a lively, solidly rhythmic rendition of that familiar theme, they marched into a formation that spelled out James Bond’s designation, “007”. Ah, but you see, I was sitting on the visitor’s side of the field, so the marching band’s formation was upside down from where I sat. I looked up and saw that, to my eye, the band had spelled out “LOO”. That cinched it. It was a sign. I immediately bolted from my seat and made my way to the line leading to the men’s room. And for the record, the line moved quickly and I was back in my seat just in time for the second half kickoff. In closing, I just want to say that I had a great time. The vibe at a college football game is vastly different from what you feel at an NFL game. Each is wonderful in its own way, but there is a level of emotion and charm at a college game that I have resolved to experience more often going forward.